As I continue my sustainable holiday theme I wanted to include some DIY projects you can create with items you most likely have around the house. You know I love a good t-shirt refashion and wanted to design a versatile look that could be worn for a day out shopping or a special holiday occasion. I've been doing a lot of partnered posts lately so I was anxious to get into my sewing studio the other day and just randomly create something Trash to Couture style. I don't know how my mind thought of this but I've always loved the look of chains as an embellishment, very Coco Chanel. This can be no sew too and takes less than an hour. 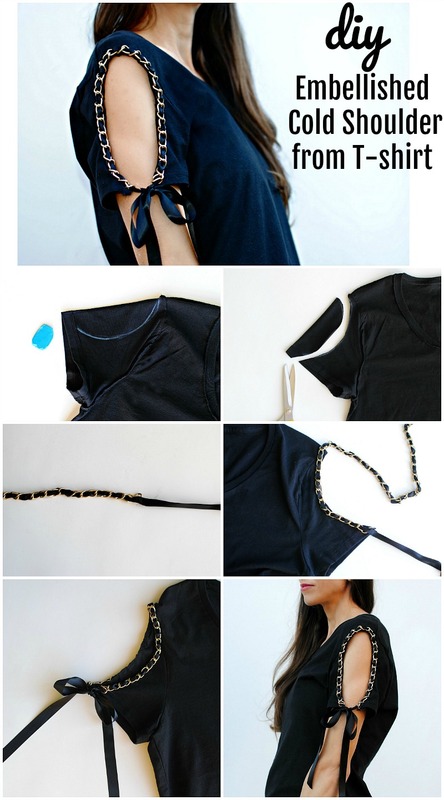 Get the details below on how to make your own Coco Cold Shoulder Tee just in time for the holidays. Get a t-shirt and lay it flat so the seams are even. Use tailors chalk and mark an oval shape going from the tip of the shoulder seam to about 1" out from the folded edge. Cut this outline and use as the template for the other side. Get a chain or any type of trim that measures the portion you cut out. Use ribbon to weave in and out of the chain and leave a tail on each end to tie into a bow to connect the ends of the sleeve. Hand sew weaving in and out of the chain to secure it into place. OR hot glue the chain trim into place but be sure to do small dabs so it doesn't show through. So nice designed dress it is. And thanks to this post sharing with us. You are welcomed my divorce lawyer castle rock site also. Love this idea! Thanks. The other comments are so weird and hv no significants towards this diy.